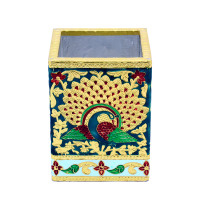 The intricate minakari work and the dazzle of numerous beads make this an ultimate decorative and gift item fit to adorn the work tables of people considered high and the mighty. 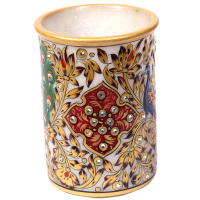 The color combination interspersed with dazzling beads adds to the beauty and grace of this cylindrical piece of art that looks extremely attractive irrespective of whether viewed at close angles or from distance. 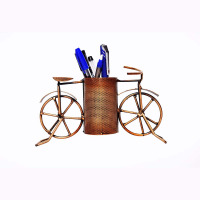 An elegant and simple looking pen stand to add some life into your study. 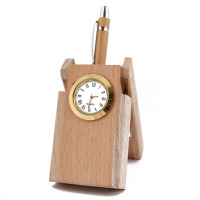 This wooden pen stand with abuilt in watch is classy as well as useful. Not only will it help keep your pen in plain view, it will also tell the time. Making your home look good can be a passion for you. You may have some of the finest ideas too. Add the grace of Gems Stone Dairy Set and get a grand look! 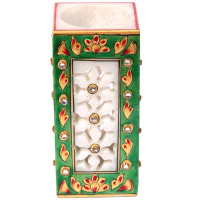 The triangular pen stand with Gemstone painting is a perfect product to have as a desk organizer. Convey your gratitude to the artisan by having it only from boontoon. 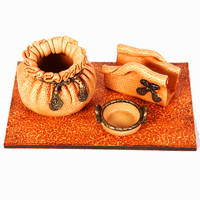 The cream colored accessories adorned with burnt sienna strings and trimmings gift a treat for the eyes. 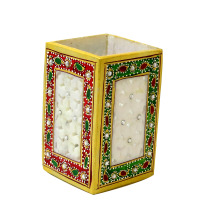 Adding grace to this ethnic artwork are the numerous beads that adorn the borders of this decorative stand. 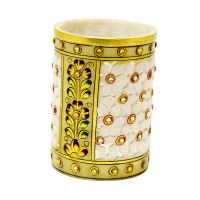 The use of beads further enhances the beauty of this magnificent piece of artwork that is a perfect example of great craftsmanship and delicate skill of marble cutting. Love of beauty is taste and the creation of beauty is art. The job of the artist is to offer a sanctuary of beauty to an ugly world. Unless and until the surrounding of an artist is well organized and beautifully arranged, he simply cannot perform his job. Whether a pen stand, a key holder or a desk organizer, all are tools for organizing the mess not only on your table but also in your life. Boontoon with the most diverse collection of elegant handmade Indian handicrafts serves just the same purpose in your life by providing you an opportunity to choose from among the finest and most unique handicrafts, which not only help to organize your life but also serve a decorative purpose and by full filling your aesthetic needs and giving you spiritual and mental satisfaction. 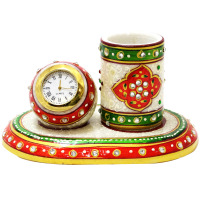 You can also gift these handicraft items to your loved one showing your affections and deep love or to relatives on special occasions like Diwali, Eid, and teacher’s day as a symbol of your love. One piece of calligraphy equipment that may be overlooked but is definitely an essential part of the calligrapher's utensils is the calligraphy pen holder. Organizing pens and other writing/drawing tools are important, especially if you need to use them regularly. Sometimes, one may have a ton of pens and pencils around the desk at any given moment so getting this pen mess organized is pretty important. 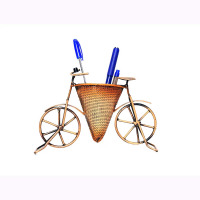 A pen and pencil holder does just what it implies; it holds pens and pencils. 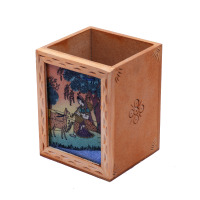 Although a box or a bag can also hold pencils and pens, but a holder usually refers to a cylinder-shaped container in which the writing instruments are placed upright. 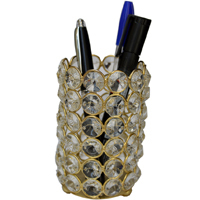 These pen stands look elegant and can also be used as home décor as well. 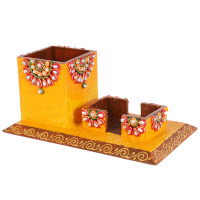 Study table or office space these handmade Rajasthani pen holders not only organize your precious items and keep them safe but also occupy less space and beautifully merge with other stuff on the table giving a decorative look. 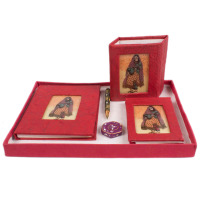 These can also be used as retirement gifts or corporate gifts to employees or clients to convey your gratitude. 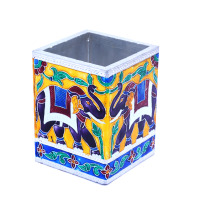 Our artisans craft these marvellous pen stands in different shapes like octagonal, hexagonal, cylindrical, round or cylindrical and in beautiful colours so that every customer gets according to their demands. 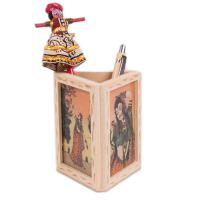 Pen stands have also become items of decoration as they can be designed manually and also for the craft purpose for small children. 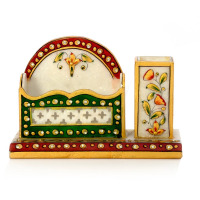 The varieties in which these pen stands are made include ceramic, marble, glass, cardboard, wood, metal or enamelled metal. A pen stand usually has a mouth of the same width as the base to keep as many pens, pencils at a time. 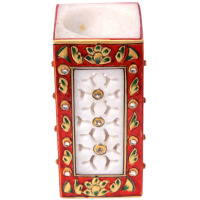 Our pen stands are also made by using gem stone painting, cardboard paper, marbled paper and unique ways are used to design these pen stands to make these look graceful and beautiful. 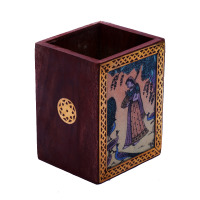 Wooden pencil stands are made using high quality wood and come in various designs, patterns, sizes, and shapes. 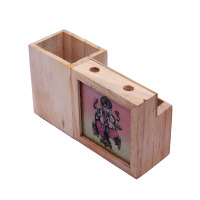 The charm and the beauty of these wooden pencil holders come out when it is kept on the table top and adjusted it accordingly. Our products are made of pure, durable and eco-friendly materials which do no harm to our environment and can be recycled easily. 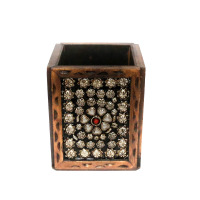 Pen and pencil stands are also made out of glass and are beautifully designed with red and white crystal stones. 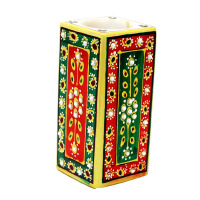 These holders are durable and have splendid look and thus are used effectively for office purposes. You can personalize these pen stands by adding your company name to it & logo and give it as a corporate gift to employees and clients. 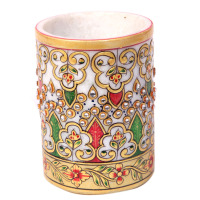 Boontoon is the most trusted network of 100% pure handmade Indian handicrafts at best prices so that you get what gives you pleasure and happiness. Our items are delivered all around the globe and are highly praised not just in India but also in Australia, Canada, UK, and the USA. Bulk orders are also supplied to all parts of the world. Fast shipping, best prices, and costumers satisfaction are what earned us fame as shown in our rating and reviews and we aim to continue doing so.